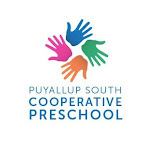 Puyallup South Cooperative Preschool: WELCOME! Established in 1975 with the vision to provide an educational environment where parents would share in their child's early learning experiences. Our preschool is parent organized and operated with the guidance of the Home and Family Life Department of Bates Technical College, the dedication and vision of our outstanding teacher, and the collaboration and support of the families who truly embody the "cooperative spirit." We are proud to have created a secure and nurturing environment for our children and parents for more than 35 years. Puyallup South is a non-profit organization that admits students of any race, color, national and ethnic origin to all rights, privileges, programs and activities at the school. To help develop strong and healthy families in our community by providing high-quality learning experiences for children and their families.